Anti-Age Antioxidant Face Toner is produced by the Russian beauty brand Baikal Herbals. It is formulated with Baikal plant extracts. The product deeply cleanses your skin, keeps it fresh all day and improves skin elasticity. Ginseng has a rejuvenating effect and stimulates active skin cell regeneration. Beggarticks helps to soothe the skin. Amur adonis helps to get rid of toxins. Sea buckthorn is a natural antioxidant, it prevents premature skin ageing. Due to its natural active ingredients, the toner smooths the skin and has a lifting effect, prevents premature wrinkles. Paraben free and PEG free. Ingredients. Aqua with infusions of: Adonis Amurensis Extract, Organic Panax Ginseng Extract, Bidens Tripartita Extract, Hippophae Rhamnoides Fruit Oil, Organic Malva Sylvestris Extract, Organic Mellissa Officinalis Extract; Glycerin, Lauryl Glucoside, Decyl Glucoside, Parfum, Citric Acid, Benzyl Alcohol, Benzoic Acid, Sorbic Acid. Directions. Apply a small amount of toner onto a cotton pad, clean the skin of your face and neck. Want to buy Anti-Age Antioxidant Face Toner? Call us or submit your order via our web site! Baikal Herbals is a well-known Russian cosmetic brand. 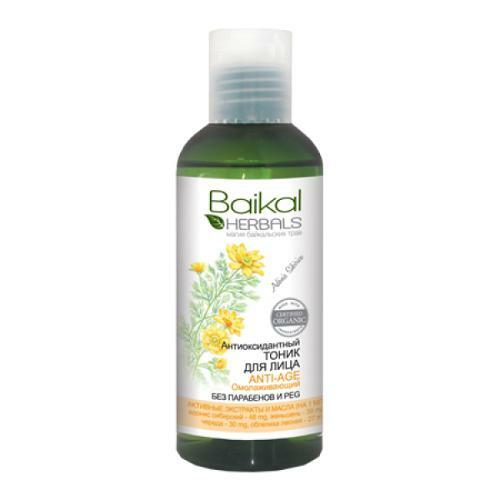 Its products are formulated with natural extracts and oils derived from Baikal medicinal herbs. Each Baikal Herbals beauty product contains a carefully balanced combination of ingredients designed for everyday hair / skin / body care which is ideal for women who live in the continental climate. Natural active ingredients contained in Baikal Herbals products provide effective care, help to cope with existing skin and hair problems and prevent their reemergence. The series contains products for all hair and skin types. Each cosmetic product branded as Baikal Herbals contains natural herbal extracts as well as vegetable and essential oils derived from Baikal herbs, certified organic ingredients, safe food preservatives authorised by the Ministry of Health of the Russian Federation. Baikal Herbals products are free of parabens, SLS (sodium lauryl sulfate), SLES (sodium laureth sulfate) and PEG (polyethylene glycol).